4th re-read of the year for Barbara Michaels done. 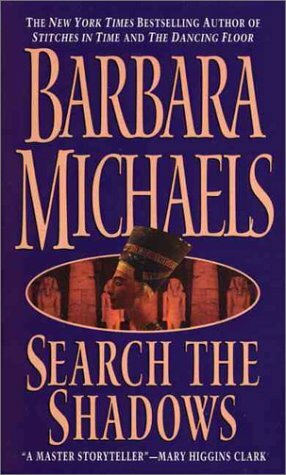 Barbara Michaels, the pen name for Elizabeth Mertz, was an Egyptologist for her other career. It’s expected that the accomplished woman who want to sneak Egyptology themes and settings into even her Gothic work under the Michaels name. Even if this book is set with a museum curator’s work, there is nothing about artifacts and Egyptology here – instead the protagonist Haskell, obsessed with her mother’s death and who her father may actually be, is digging through another sort of potent history, her own biological tree.The premise is sound, the pacing as structured as can be with this kind of story, but the plot is too calm. It’s not enough to warrant a full-length novel, so there is lagging.An attempt or so on Haskell’s life paints a gothic splash, suspense is only there toward the end during a confrontation with the big bad, and the mystery – while not obvious exactly – isn’t that interesting because by the end I didn’t care much who the real father was. Romance is in the background to where I wasn’t sure who she’d end up choosing, but I was happy with the choice when it was made.I do wish something different had happened with the elderly museum director, however. I think there was emotional potential when she discovered who he really was to her. Tragedy cut those strings too abruptly.Overall this is an average read – Michaels writing style is addicting to me, so I could easily keep reading, but it’s a story that passes through the eyes and then out the brain again. Just not memorable. If you’re new to Michaels, start elsewhere, but if you’re a fan, it’s worth a read. Amazingly, this is the first Barbara Michaels I’ve ever read. It was a good page-turner, and the mystery was satisfyingly atmospheric in its gothicness and twisty with its misdirection. The romance, however, felt sort of tacked-on at the end. I was pleased to have a romance with an intentionally unlikeable heroine, for a change. She’s rude and selfish, snide towards all other women, and feels very little sense of guilt over neglecting her relations. She also does not hesitate to use any tools available to her to achieve her own ends, including people. But of course, she is also beautiful and unaware of it, feeling that her dark coloring makes her unattractive in comparison to her fair-skinned and fair-haired mother. This makes pretty much every man she encounters willing to (view spoiler)[ literally (hide spoiler)] walk over fire to help her.I read this for the 2017 Romance Bingo. It fits the Gothic Romance square, as it has most of the elements of gothic literature, except the usual supernatural one, if you discount several characters who seem to have almost psychic thought connection or leaps of intuition. I had forgotten how wordy Barbara Michaels could be. Whew! I do like her stories, although I think this is one of my least favorite. (so of course I read it first, go figure) It has been over 20 years since I had read them.Haskell has lots of questions about her parents, and very few answers. Aunt Jessie doesn't know anything, and remembering what she does is very painful for her. So it is almost like this big elephant in the room between them.So Haskell goes looking for answers, and what she finds is more confusing. There are a lot of twists in this one. You aren't sure until the end, exactly who her father is. Someone is trying to kill her, but who or how many.This is a good mystery, and I while I do recommend Ms Michaels, I don't know that I recommend this one. I did like it, but meh? Kind of dated, typewriters and telephones, no computers or cell phones, but it's not too glaring. The book was written in the 80's and has a slower feel to it. I think it was slower to try to build tension, but it didn't work too well in my opinion. The characters were all somewhat two dimensional, but stuck to the tropes from which they came, with the exception of the "big bad" and the aunt, who was much more prominent in the beginning than she was when the ridiculously named hMC left for Chicago.The romance was predictable, but completely unbelievable. Slight spoiler ahead. I detest young female protags with a much older man. It is skeevy to me. Yes, it happens in real life. I rather not read it in my fiction. Personal pet peeve. The love square was rather unnecessary and had me rolling my eyes. The hMC was the typical "beautiful but didn't know it" character. Also, all of the other females were either old and beloved, old and sad and frumpy and bitchy or young, only used as a bitchier foil for our hMC to make the rather judgmental and naive hMC appear in a better light. It didn't work. I didn't really like the hMC or her eventually love interest. Slight spoiler, he was too much of a brute who man-handled her. He's kissing her and causing bruising? He has hold of her by the shoulders and gives her a hard shake, causing her head to snap back, IN PUBLIC, the FIRST TIME they meet? Hell-to-the-no. The best part of this book for me was the writing, specifically the interactions involving our young and naive hMC with an older and wiser female. Though in the beginning our hMC had a few zingers, the older and wiser women ruled in my opinion. I especially liked Jessie and Aunt E. (can't recall her full name right now). The parts that actually described the work our hMC was doing was very interesting. I love research and digging through old books and journals and hunting for treasures in boxes of dusty old junk. It sounded heavenly! A whole cellar in a mansion of antiquities to sort through and old journals to transcribe, to hunt down when and where each piece was procured. Right in my wheelhouse.Imagine how disappointed I was to get banal conversation while our hMC and one of her guys was eating. Boooriiiing! More boring? The mystery about who was her biological father. Don't care. Give me more research! I want more research! (Stamping foot and pouting, arms crossed. )Not a bad book, but it doesn't compare to her "Houses of Stone", which I enjoyed more. Had a more supernatural feel, more danger and more excitement. Full disclosure, I skipped from page 280 to about 30 pages to the end because I got too bored to continue reading straight through. If I read ONE MORE scene of the hMC and someone else eating, the book was going to be pitched across the room. The only "exciting" part wasn't even exciting, with the fire happening while our hMC was half out of it and therefore was a semi-conscious narrator. As a result, less than terrifying fire scene and rescue.If you like her other works, you will most likely enjoy this. I wasn't thrilled, but it wasn't bad. An entertaining way to spend the morning of afternoon. Three solid stars. Had read it before, but enjoyed it again -- even though I did vaguely remember the outcome. But living in Chicago now and knowing the University of Chicago and its environs gave me extra enjoyment on this re-reading, as a large portion of it is set in Chicago and the U of C area. Fun mystery about a young woman who sets out to find out about her mother's life and figure out who her biological father was, and about the trouble dragging up the past brings -- especially among archaeologists. Whenever I'm not sure what to read next, I know I can always pick up a Barbara Michaels book and be able to slip right in. They're especially good when I'm suffering from a book hangover (when you finish a book that was so good you couldn't put it down and when you do finish it way too soon you have trouble pulling yourself out of the world of that book), making them, I guess, a good chaser. Haskell Maloney has been raised by her aunt, losing her mother when an infant and the man she thought was her father before she was even born. When, as an adult, she discovers that man couldn't possibly be her father, she sets out to solve the mystery of her parentage, going back to the academic world her mother inhabited in her Egyptological studies. When researching her origins, she becomes involved with the eccentric, crazy, and sometimes crazed people her mother interacted with in her own youth. She also finds that someone doesn't want her to find out who her father was. A good suspense with a little romance thrown in and an eclectic cast of characters, this got me through my book hangover admirably. Now, what to read next? Barbara Michaels is a consistent, dependable author for varied stories, interesting characters and exciting plots. This book is no exception. Haskell Moloney was named after a museum, the museum her Egyptology-student mother was attending at the time of her birth. Left orphaned after her father was killed in Vietnam and her mother short months after Haskell's birth in a car accident, Haskell was raised by her mother's sister, who doted on and loved her into adulthood.When a pre-marital genentic screening shows a gene for Tay-Sachs syndrome - highly unlikely for the child of an Irish Catholic father and a Pennsylvania Dutch mother - Haskell realizes there's a mystery about her parentage that involves the past of her mother.Deciding she has to learn the truth, Haskell breaks off her engagement, and uses her mother's name and reputation to be taken on as an unpaid intern at the famed Oriental Institute, where her mother was a Ph. D student at the time of her death. She's convinced the truth about who her father was is somewhere in the mysterious halls of the Institute, but it will take some doing to penetrate the secrects people there have been protecting for more than two decades.Barbara Michaels herself actually attended the Oriental Institute in Chicago, and the knowledge comes across in the depiction of the Institute, making it come to life in a way that probably wouldn't be possible for someone who didn't know it well. If you have any interest in Egypt or Egyptology [I do] then you will enjoy the descriptions of artifacts, important figures and history of Egypt that are included as part of the story.The characters are also really well developed in this book and they run the gamut from "average" everyday people, like Haskell's aunt, through the chain-smoking profanity spewing professor at the institute, to the wealthy, frail yet still controllingly dictatorial owner of the Institute who keeps everyone around him dancing to his tune. There are all kinds of colourful and unique characters included in this story and each of them add to the enjoyment of the book.Haskell in particular is an engaging character. Torn between the comfort of the life she thought she had, and the mystery and potential heart-break of finding out the truth about not only her mother, but the truth about who she herself actually is as an adult is interesting to follow. As with all Barbara Michaels books, there are plenty of misleading red herrings tossed at you to try to keep the truth hidden. Although Michaels doesn't write really hard to decipher mysteries, it's the plot and character development, combined with very entertaining humour [some of the characters have just hilarious lines throughout the book] that make Michaels an author who's books I will happily read again and again.I really enjoyed this one! Barbara Michaels, who has a Ph.D. in Egyptology from the University of Chicago, is a prolific writer under her own name, as well as the name Elizabeth Peters, which she used when writing a series on Egypt in the 20's and 30's.Her books often deal with borderline occult issues; however, Search the Shadows is a fairly straight-forward story of a young woman, Haskell Maloney, whose mother died in an auto accident when she was only 3 months old. Now a young adult and very recent graduate with a degree in Egyptology, she discovers during a medical premarital exam that she is a Tay-Sachs carrier, a genetic disorder generally limited to Eastern European Jews. Nothing in her family history indicates that she should carry such a genetic disorder. There is some mystery in her birth as her mother married a soldier who shipped out for Vietnam and was killed before Haskell was born. It was a sudden marriage and she has very little knowledge of her father, except that his name indicates that he was Irish Catholic.Haskell's mother Leah was a doctoral student at the Oriental Institute of the University of Chicago, and Haskell, after calling off her planned marriage to an attorney who also is a Tay-Sachs carrier, moves to Chicago to learn more about her mother's life before Haskell was conceived.Willing suspension of disbelief is always a key ingredient to enjoy good fiction, and Search the Shadows requires only a modicum in order to enjoy Haskell's experiences as she meets and becomes a part of the studies of Egyptology in Chicago, where she becomes part of a group that includes several people that were a part of her mother's life.And yes, she does discover the secrets that had been hidden regarding her life. Search the Shadows remains one of my better favorites among my Barbara Michaels collection, and is one I like to re-read periodically.Young Haskell Maloney is quite shocked to discover that she carries the genes for a rare disease called Tay-Sachs, which she could not possibly have gotten unless she'd inherited it from both parents--which means that one of her parents isn't who she thought. Her quest to find out the true identity of her father, and by extension what caused her mother's death, leads her to Chicago on her mother's trail. Soon she's tracking down her mother's old classmates from college, a couple of whom are professors now in their own right, and she scores herself a job working on the private artifact collection of the very man who might well be her own grandfather. Problem is, it also puts her square in the line of fire of someone who'd just as soon keep the secret of Haskell's parentage secret, and who doesn't scruple to attack Haskell herself.I give Barbara Michaels props for trying to avoid the usual cliches in describing her heros and/or heroines in this book; this time around it worked a bit against her as I wound up wondering exactly what our heroine sees in a gentleman most frequently described in terms of how hairy he is. (Fortunately, he's also a strong character in general, and what she sees becomes evident later. )We do of course have an open question as to which man our heroine will choose, but the resolution to this felt a little hurried and after-the-fact to me, as if Michaels was done telling the main story and then suddenly thought "OH NO, right, I've got to resolve the romance!" Still though, fun read. Three stars. I first read this book when I was 11 and am currently going through a phase where I'm re-reading a lot of Barbara Michaels' books. I originally got into her books because they normally had a supernatural twist that appealed to me. This one is a more straightforward mystery/thriller - Haskell is about to get married when she discovered that she is a carrier for Tay-Sachs disease, which leads her to find out that the man she thought was her father (a soldier killed in the Vietnam War) was not. Her mother is also dead, killed in a car accident when she was three months. Haskell decides to go to Chicago to re-trace the last year of her mother's life in order to find out more about both her mother and her father, not realizing that it could uncover secrets others want to stay hidden.I'm sure I've read this book at least four times now, and it was still a page-turner (even though I knew how it would turn out). It's helpful to remember that this book came out in the mid-1980's, before DNA-technology became so accessible. At one point, Haskell is grateful that there is no way to prove that she's definitely related to another character and I mentally shook my head (and reminded myself that this was true in the '80s). Also, it's a reminder of what life was like before cell phones. It's easy to forget that in the past, sometimes having access to a phone wasn't a given. After finishing this book I discovered that author Barbara Michaels also writes under the name Elizabeth Peters! Haskell Maloney finds out during a pre-marital exam that she is a Tay-Sachs carrier (a genetic disorder generally limited to Eastern European Jews). Her mother was killed in a car accident when she was 3 months old, and her father, an Irish Catholic, was killed in Vietnam before she was born. Like her mother, Haskell has a degree in Egyptology. She travels to Chicago and gets a non-paid job at the Oriental Institute at the Univ. of Chicago where her mother went to school. She plans to learn more about her mother and try to figure out who her real father is. What she finds is unexplained secrets, mystery, romance and lots of potential possibilities for a father. The climax takes place in a cold, silent museum filled with Egyptian artifacts and lots of suspense and a surprise who-done-it. A quick easy read. I really like this one a lot, but I loaned it to a friend once who thought it was absolutely terrible, so what do I know? I just kind of love that it takes place at the Oriental Institute and that the main mystery is Haskell's quest to find out whether her mother's death was an accident or murder. I guess I'm more interested in murder mysteries where the victim is someone the main character actually knows as opposed to the sort where someone sort of just stumbles over a body or something. I like the way in this book, Haskell sort of immerses herself in her mother's old life at the Institute to find out what happened. There's also nothing at all supernatural about this one, which is odd for a Barbara Michaels book. Yes, it's cheesy. Yes, the premise is a little ridiculous. But. I don't know, it just works for me. Haskell is my kind of gal~Spunky and willing to go to any leangths to find out the answers to her own questions.I loved her struggle with her inner demons, and the way Ms. Michaels wove true Egptology into the plot. Every book of Michaels' is a treasure filled with so much humor and life.There are little jokes throughout that kept me laughing, while I was so involved in the mystery of the story that I can't believe Michaels pulls that off.Clever. Barbara Michaels is the queen of modern gothic fiction, and this story is one of her bests. Set in modern-day University of Chicago (where Michaels got her degree in Egyptology), the main character is an Egyptologist post-doc who discovers her parents probably biological, and goes seeking her true history. Very gothic, with lots of menacing hints, unspoken secrets that no one else want revealed, and hints of, perhaps, some Egyptian curse. since i like to read about antiquities and egyptian artifacts, i should have liked this book better than i did. at least the heroine wasn't described as a drop-dead gorgeous woman. although there were some exciting parts, such as almost being burned to death, this seemed rather humdrum. i guess that i missed the part where, although she didn't have a salary, she still had enough money to live. having the ex-fiance turn up in chicago seemed superfluous. Okay, but can I mention that I spent waaaay too much time trying to locate the Grandmother's house in Oak Park geographically? Drat you, google street view!A Vicki Blissesque plot with a less appealing heroine, a bit of gothiciness, and lots of good description, but this is another Peters that feels too outdated to me. Michaels works her trademark gothic mojo here, this time on the uberunGothy Windy City. The romance here is - much like in her Night of the 400 Rabbits - somewhat out of the blue, but the quirky characters and pacing make up for any qualms. Solid work, but not her best by any means. Still, fun to read while you're in Chicago. I have enjoyed this book several times through the past few years but I found it a little less appealing lately. I realized I really don't like the heroine. I find the setting and subject quite interesting. The storyline is good. The heroine is self-righteous and judgmental. I love Barbara Michaels but this one is a little way down the list. A Barbara Michaels book that I hadn't read before? I was surprised to find such a thing. I certainly enjoyed reading it, although I was surprised by the lack of anything remotely supernatural. Also, the romance that blossomed at the end seemed a tad unrealistic. Still, the book was entertaining, and I did not at all guess who the villain was before the reveal! This wasn't Barbara Mertz's best work - she, writing under Elizabeth Peters pseudonym, is a favorite of mine. However it was very interesting to see how she wrote of ancient Egyptian life, locations (Armana, for example), which is a deep focus of the Amelia Peabody series. For this I enjoyed it thoroughly! Can't remember this one, so I'm rereading it. I don't remember it so far, but if it gets familiar, I will probably quit. :)I did remember it about half way through... but this one is a fine novel. What I love about Michaels is her obvious intellect and ability to inject big issues and problems (murder of a parent, Tay-Sachs disease, illegitimacy, Egyptology etc) into a suspense novel. Michaels returns to her old stomping ground by having the heroine in this book travel to Chicago to work & mingle with the UChicago Egyptology program. Standard plot & romance for Michaels, so I real pleasure to read. Warning a bit dated, but nothing that really disturbs the tale. The plot was hokey and full of holes and yet I enjoyed it thoroughly. Mixed in with the mystery of who is Haskell's real father and how did her mother die is some nice discussion on the Amarna period. Only made it through about one-third of this book and, even that far in, it seemed like the book was still being set up. Way, way too much lead up to whatever in the world is supposed to be happening to hold my interest. Nonetheless, the writing was good. What a fun book! It's part mystery and part romance with a splash of history and science thrown in. I enjoyed it right up until the very end. Then she sort of lost me. Overall, I would recommend it to anyone looking for a quick, easy read that requires very little deep thinking. A light mystery novel, Search the Shadows is filled with characters you'll find in many other Elizabeth Peters novels, most notably the plucky and headstrong heroine, and the brave, brash and arrogant hero. Nothing remarkable but a fun read nonetheless. Not as good as the Amelia Peabody series or the Vicky Bliss series. This is a standalone and the ending is abrupt, which left a bad taste in my mouth. If you like Egyptian history this is a great mystery for you! Barbara Michaels - Barbara Michaels was a pen name of Barbara Mertz. She also wrote as Elizabeth Peters, as well as under her own name. She was born in Canton, Illinois and has written over fifty books including some in Egyptology. Dr. Mertz also holds a Ph.D. from the University of Chicago in Egyptology.